Molossus, large, its total length reaches approximately one third of the height at the withers. Planes of the skull and muzzle are slightly convergent; they are not parallel. The circumference of the head measured at the cheekbones is more than twice the total length of the head; skin is firm and smooth. Skull - Viewed from the front, skull is wide and slightly curved; width is equal to the length. From the side, a prominent arch begins above the eyes and then flattens backward toward the occiput. Viewed from the top, it has a square appearance due to the zygomatic arches and powerful muscles swathing it. Stop - Well-defined due to developed and bulging frontal sinuses and prominent arch above the eyes. Expression - Very alert and attentive. Some wrinkling on forehead occurs when alert. Eyes - Medium-size, almond-shaped, not round or bulging, tight fitting rims preferred with only a minimal amount of haw being visible. Eye color-Dogs with black muzzles (coat colors of black, fawn or red, and these colors brindled) dark brown eyes are preferred. Gray muzzles (coat colors of gray, fawn or red and these colors brindled), lighter shades are approved. Pigmentation of the eye rims is complete, pigmentation of eye rim matches pigment color of dog. Disqualification - Yellow bird of prey; blue eyes. Ears - Set well above the cheekbones. May be cropped or uncropped. If cropped, it is in an equilateral triangle. If uncropped, they are medium size, triangular in shape, held tight to the cheeks, and not extending beyond the jaw bone. Nose - Large with well-opened nostrils, pigment color to match pigment color of the dog. Dogs with black pigment have black noses; gray pigmented dogs have gray noses; pigmentation is complete. The nose is an extension of the topline of the muzzle and does not protrude beyond nor recede behind the front plane of the muzzle. Muzzle - Very broad and deep, width is almost equal to its length, which reaches approximately one third of the total length of the head; the depth of muzzle is more than 50 percent of the length of the muzzle. The top and bottom muzzle planes are parallel, and the nose and chin form a perpendicular line. Viewed from the front, the anterior face should look flat and form a trapezoid, wider at the bottom. Muzzle is not overly narrow or snipey. Lips - Rather firm. Upper lips moderately hanging, they join under the nostrils to form an inverted "U." Pigmentation matches color pigment of dog. Dogs with black pigment have black lips; gray pigmented dogs have gray lips. Bite - Slightly undershot (no more than ¼ inch) and level preferred. Scissor bite is acceptable, if parameters of the head and muzzle are correct. Dentition is complete. Incisors are in a straight line. No more than two missing teeth. Disqualification - More than two missing teeth; wry mouth. Undershot more than ¼ inch. Neck-Slightly arched, flowing smoothly into the shoulders with a small amount of dewlap. The length of the neck is approximately one third the height at the withers. Body - Depth of the ribcage is equal to half the total height of the dog, descending slightly below the elbow. Ribs are long and well sprung. Moderate tuck up. Chest - Broad, well-muscled, strong forefront. Back - Wide, strong, muscular. Highest part of shoulder blade slightly rising above the strong, level back. Loin - Well-muscled, and harmoniously joined to the back. Croup - Long, wide, slightly sloping. Rump should be quite round due to muscling.Tail - Tail set is an extension of the backline. It is thick at the root with not much tapering at the tip. When not in action, carried low, otherwise horizontal or slightly higher than back, not to be carried in a vertical position. It is docked at the fourth vertebrae. In the case of natural tails, the tip reaches the hock but not below. Carried low, it is neither broken nor kinked but supple. Hanging when the dog is in repose; generally carried level with the back or slightly above the level of the back when the dog is in action, without curving over the back or being curled. Disqualification - A natural tail that is atrophied or a natural tail that is knotted and laterally deviated or twisted. 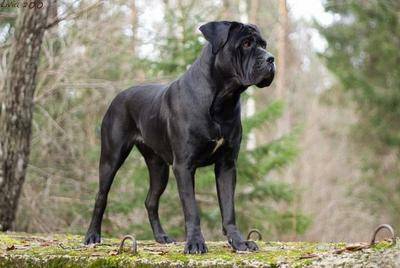 Click Here to Learn about breeder background checks on Cane Corso breeders if you are looking for Cane Corso puppies for sale. Click Here to learn how ResearchBreeder.com can help you find healthy Cane Corso puppies for sale. Click Here to order a Breeder or Kennel Background Check on Cane Corso Breeders that may have Cane Corso puppies for sale. Click here to find the national breed club for Cane Corso puppies for sale. Click Here to purchase a list of approved ResearchBreeder.com Cane Corso Breeders who have Cane Corso puppies for sale.